at left. The owner said she was bitten by a brown recluse or black widow spider and she lost her foot. RVHS Volunteers removed the dog and Southern Indiana Rescue picked her up. Also on the property was a very small pit bull puppy chained by the neck, no collar, with the chain wrapped around his little neck and a pad lock holding the chain together. His dog house had no bedding and he was shivering in the cold. We provided straw and we obtained the owner's permission to keep straw in the dilapidated dog house. We revisited the property and spoke with the owner after once again viewing the little pup shaking in the cold weather. We convinced him the dog needed to be taken inside. We also told him the dog needed improved housing with plenty of bedding. We offered to take the dog but he said no. The last time we checked the dog was gone and neighbors said he and his wife had to move and the dog was given away. *This situation was only 5 doors down from where Victor was chained and who we rescued. Cindy then transported Kris to a safe location. Heavenly Hounds Lounge Vacation Kennel in Crawford County generously agreed to donate a free grooming for Kris. Thanks to Frank, Cindy, Dawn and Heavenly Hounds for caring about Kris and putting those concerns into action. Thank you Bill and Debbie for purchasing and donating the dog trap which was used to rescue Kris. Kris is in his forever home. He is a young highly intelligent red and white border collie. Where he came from nobody knows. But he's home now. We transported this 17 year old Crawford County Indiana dog to the vet for medical care. She had been hit by a car. Her treatment included shaving her matted coat. She has been very upset with everyone according to her family. We certainly understand. We asked if anyone would want to donate a sweater for her. See the photo of the new sweaters and blankets donated by Elizabeth Starck. 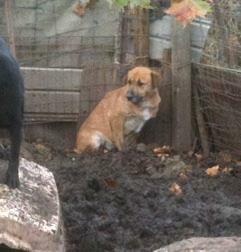 We received a report there were nine dogs living in a mud pit without shelter. Arriving at the property on a very cold day we discovered conditions were much worse than expected. 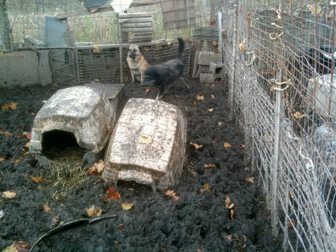 In the pen shown seven female dogs were separated from two males. Only two intact dog houses were available and both were full of mud. Two small sauce pans served as their water bowls both full of mud and there were no food dishes. Because there were no gates on the pen the owner simply threw the food over the top of the pen into the mud mix. The dogs were ingesting dog food, mud, urine and feces when they ate. During the freezing cold nights and rain storms there was literally no way the dogs could escape from the mud other than trying to perch on top of the pieces of dog houses. The owner agreed to let us have all of the dogs then decided to keep two. Southern Indiana Rescue assisted with this case. We provided dog houses, bedding and pallets for the two remaining dogs. Because the owner made it clear he wanted help when we visited the property we offered that assistance with a positive attitude. All pet guardians asking for help should expect to be treated with dignity and respect regardless of the conditions, RVHS volunteers adhere to that policy. This case could easily have been turned over to state authorities but a response could have taken days or weeks. In light of the weather and horrific conditions of the dogs we removed them. This is but one example of the many cases we have handled regarding chained and penned dogs who did not have any shelter/dog houses available. The dogs had been kept this way for at least five years. With no animal control agency these cases have been neglected for years. There are many more chained and penned dogs who will suffer this winter due to lack of proper housing and bedding and due the lack of animal control and shelter services. With your help RVHS can continue responding to animal-related complaints in Crawford County and other non-sheltered communities. This is one example of what we do. Amazingly, an anti-animal hate group accused us of fabricating this story and intimidating the pet owner. He actually wanted help and shook my hand as soon as we made the first visit. Video, photos, two police officers at the property and at least ten witnesses meant nothing. The group believes the nine dogs were lifted out over the fence every day, put in the trailer where the owner lived then returned to the pen by lifting each dog back over the top of the fence when he had to go to work. We had to use a ladder and stand on bales of hay to get the dogs out. It took quite a while, the dogs were heavy and they were slinging slimy mud all over us. The smell was unbelievable. Dog cowering in the back corner was covered in bites from repeated dog attacks. 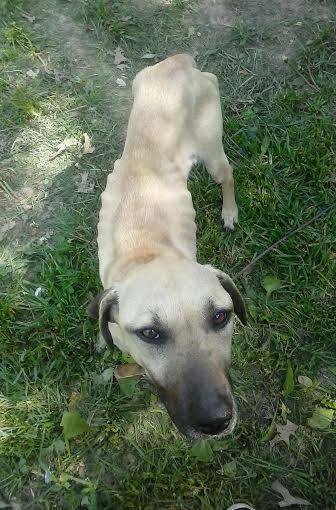 Neglected sweet girl pleading for help. Crawford County Indiana. We were called to investigate a report regarding two dogs tied to a trailer's deck with no dog houses available. See photos below. When we arrived during a rain storm the two dogs in Photo 1 were on such short chains they could barely keep their faces from touching the posts. According to the person making the complaint they had been like this for six months during rain and snow, cold and hot weather. Next to the trailer on the right we saw the cream colored dog chained to an inadequate dog house. We then heard a sound on the other side of a junk pile. There was the border collie mix shown in Photo 2 on a very short chained which was wrapped around a tire. She also did not have shelter. Suddenly we heard sound down the hill and out from under a bush the fifth dog was seen as shown in Photo 3. He was literally tied to a bush, no shelter, and when he emerged he shook and the spray of water was astonishing. He couldn't bark, he tried but made no sound. His head had a dent and one of his eyes bulged out. One of the women responsible for all of this told us that dog had been hit by a car and he was mentally disturbed and that's why they chained him back there. She explained this as she hit him in the head trying to get him to sit and to show how she had him trained. The chains were wound around and around the necks of the dogs. All were soaking wet. The woman who lived there gave the dogs up willingly. The Sheriff Department reported picking up three dogs, one with a cast. The dogs were being held at the jail. We contacted Indianapolis Humane Society and they agreed to take the dogs. We transported the three dogs plus two adult cats to IHS. The cast was removed and due to gangrene the leg was amputated. The three dogs were adopted. Thank you Indianapolis Humane Society for once again helping Crawford County.